In stock -This product will ship today if ordered within the next 7 hours and 4 minutes. 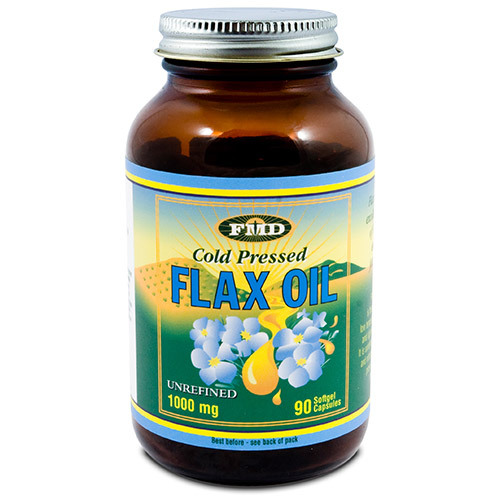 FMD Cold Pressed Flax Oil Capsules are tasty, easy to take and perfect for travelling. Freshly pressed in a light-free and oxygen-free environment. High in Omega 3 fatty acids. Scientists have given essential fats their name because the body must have them to survive, but cannot synthesize them from any other substance we eat, so a direct food source is required - hence the name essential fats. There are many kinds of fats, but only two kinds of essential fats: Omega 3 Alpha Linolenic Acid (ALA) and Omega 6 Linoleic Acid (LA), both of which are unsaturated fats. Each EFA is turned into several derivatives by the body, provided enough undamaged Omega 3 and Omega 6 are supplied in the right ratio. All other fats, such as Omega 9 (monounsaturated), Omega 7 and saturated fat are non-essential because the body can produce them from sugars and starches. 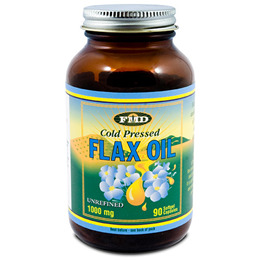 Flax Oil is an excellent source of Omega 3 ALA but is a poor source of omega 6 LA. Flax is considered to be too rich in Omega 3 for the long-term and can lead to Omega 6 deficiency because Omega 3 and Omega 6 EFAs compete for enzyme space in our cells. That is why it is important to move onto a balanced blend of Omega 3 and 6 once your Omega 3 levels have increased. Although it is generally considered that the western diet contains enough Omega 6, they generally come from poor, damaged sources. Today’s main sources of Omega 6 are cooking oils and margarines, which have been processed heavily with harsh chemicals to ensure a long shelf life. This has left us in the situation where although we do get some Omega 6 intake, it is damaged to the extent where it is now harmful, rather than beneficial to health. This means that Flax Oil is an excellent choice for those who already have quality omega 6 sources in their diet or for those wanting to build their Omega 3 levels before switching to a balanced blend. A period of around 3 months will be sufficient for most people to build up their Omega 3 levels. Freshly pressed in an oxygen and light-free environment, at temperatures that do not exceed 36 C (97 F). Flax Seed Oil, Vegetarian Capsule. Consume 1-3 capsules three times daily, preferably with meals. Below are reviews of FMD Cold Pressed Flax Seed Oil - 90 x 1000mg Capsules by bodykind customers. If you have tried this product we'd love to hear what you think so please leave a review.